Don’t Just Move 2 Milwaukee in 2019 – Discover the Latest Diners, Restaurants & Bars in Brew City! 2019 is shaping up to be quite the year for new Milwaukee restaurants and bars! From the first Korean fried chicken bar opening to new proposed restaurants, the historic third ward, east side and heart of the city won’t look or taste anything like it used to. If you want to Move 2 Milwaukee, check out the latest in local cuisine and see why so many of us love to call Milwaukee home! Foodies across Milwaukee have plenty to do after the new year begins. With all the new restaurants and bars popping up across the city, 2019 is sure to be full of new experiences for all local food lovers interested in expanding their palette. Visiting from out of town? Our up and coming neighborhoods and venues don’t have to be part of just your tour anymore. Move 2 Milwaukee and make Brew City your home! Extra: 20 Hidden Gems in Milwaukee! An upcoming Mac and Cheese restaurant in Milwaukee, Mac Shack promises to cater to all tastes. With a private catering option in the works, customers will be able to order their favorite kind of mac for home delivery. Currently planned to have a 10 oven-fried macaroni and cheese dish menu, including a make-your-own choice, Mac Shack is sure to be one of the most popular new Milwaukee restaurants in 2019 – especially for UW-Milwaukee students who live near Brady Street! Self-proclaimed as casual elegance, Voyager Wine Bar is a recently opened wine bar in the heart of Milwaukee’s trendiest neighborhood. Just across from Café Centraal in Bay View, the bar has nothing but five star reviews on Google as of the beginning of 2019. It has a modern, yet welcoming interior design and is a great place to bring family or friends when you’re ready for quality time with a tasteful drink of choice in your hand. Located just across the street from Fiserv Forum, Tavern At Turner Hall is a newly opened restaurant in downtown Milwaukee you’ll want to get out and try! Advertised as being open 2 hours before any event or show at Fiserv, the UWM Panther Arena or Turner Hall, the venue is a great stop before your night out. You can grab drinks or sit down for a filling meal any day of the week. A promising proposal, Global Fusion is an up and coming restaurant and bar set to fill the ground floor of an office building in Milwaukee. Not only will food be served, but guests can expect live music, DJ’s, dancing, karaoke and alcohol at the bar as well. The restaurant would be open from 11:00 am to 2:30 am, giving locals and tourists plenty of time to enjoy the area before grabbing a chair and plate to eat at Global Fusion. As of now, there are no updates on the development of the proposed restaurant, but we’re sure it’ll be a standout in Milwaukee cuisine and entertainment once it’s open. New Healthy Chicken Wings in Milwaukee| Good Land Wing Co.
Baking away in the third ward is Batches, a new bakery serving breakfast, lunch & dinner pastries for locals with a sweet tooth! Right next to Riverfront Pizzeria Bar & Grill & the Milwaukee Institute of Art & Design (MIAD) on the Milwaukee River, this centrally located bakery is an easy stop on your way to or form work. It’s a great place to be if you’re a fan of ice cream, coffee, brownies or cookies. Aside from their great food, the business runs fun social media accounts littered with mouth watering photos of their pastries and memes from The Office. Offering street food from around the world, Blue Bat Kitchen & Tequilaria is the first of it’s kind in Milwaukee! This duo restaurant and bar is just south of the Milwaukee Public Market and offers a number of bowls, tacos, snacks and salads to try. They open daily at 11 am and close every day at 10 except for Friday and Saturday when they’re open until midnight. Their impressive menu boasts spicy, gluten-friendly and vegetarian options. Just want a drink? There’s plenty to choose from on their Tequila menu. +Tequila, Tequila and even more Tequila! If it’s modern and french…it’s Fauntleroy! Sporting seasoned chefs, Dan Jacobs and Dan Van Rite, this new third ward restaurant re-imagines classic French dishes with a contemporary twist. Their lunch and dinner menus display a simple and sophisticated design, but the interior of the restaurant itself has a mix of form and casual dining features. Once you step inside, it’s hardly an experience you’ve ever had in Milwaukee before. Interested in what they’re serving? Breakfast, lunch and dinner any time and any day you want it at Don’s Diner & Cocktails in Walker’s Point! Well, until 10 pm or 11 pm most days. Named after an old Milwaukee Police Captain, Don Gersonde, Don’s Diner is bringing the classic diner experience back to Milwaukee. Wine, beer, shots, cocktails and even the classic shakes & floats are available with a string of other meals. Looking for vegan, gluten free or vegetarian options? They have you covered. 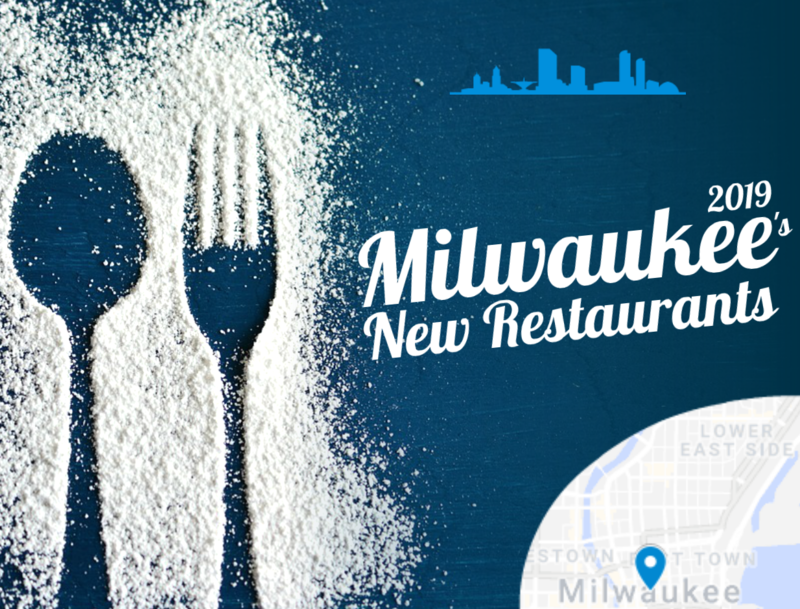 Contact Bob Arnold to find a home near your favorite new restaurants in Milwaukee of 2019!